The advent of Clean Tech requires us to to look more broadly, probably quite differently, but above all more creatively – at defense and armed force and at the role Clean Tech is likely to play in those. Military officials say that safer sources of power are needed to enhance national security. That’s a bigger motivation than reducing emissions. The report “Global Clean Energy for Defense Market and Technology Forecast to 2026” examines, analyzes, and predicts the evolution of Clean Energy technologies, markets, and outlays (expenditures) over the next 8 years – 2018-2026 in the Defense Industry. It also examines Clean Energy markets geographically, focusing on the top 95% of global markets, in the United States, Europe, and Asia. Throughout the report we show how Clean Tech is used today to add real value. 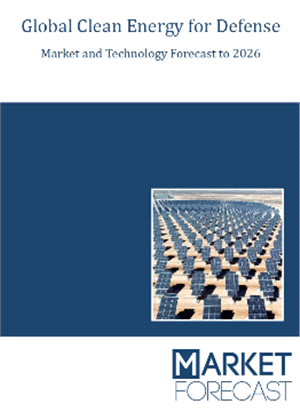 To provide the most thorough and realistic forecast, this report provides a twin-scenario analysis, including “steady state”, emergence of new Clean Energy tech in the Defense industry. Market Dynamics: Insights into the technological developments in this market and a detailed analysis of the changing preferences of governments around the world. It also analyzes changing industry structure trends and the challenges faced by the industry participants. Segment Analysis: Insights into the various Systems market from a segmental perspective and a detailed analysis of factors influencing the market for each segment. Regional Review: Insights into modernization patterns and budgetary allocation for top countries within a region. Regional Analysis: Insights into the Systems market from a regional perspective and a detailed analysis of factors influencing the market for each region. Trend Analysis : Key Civil, Commercial & Defense Market: Analysis of the key markets in each region, providing an analysis of the various Systems segments expected to be in demand in each region. Key Program Analysis: Details of the top programs in each segment expected to be executed during the forecast period. Competitive landscape Analysis: Analysis of competitive landscape of this industry. It provides an overview of key companies, together with insights such as key alliances, strategic initiatives and a brief financial analysis. Jiangsu Akcome Science & Technology Co, Ltd.